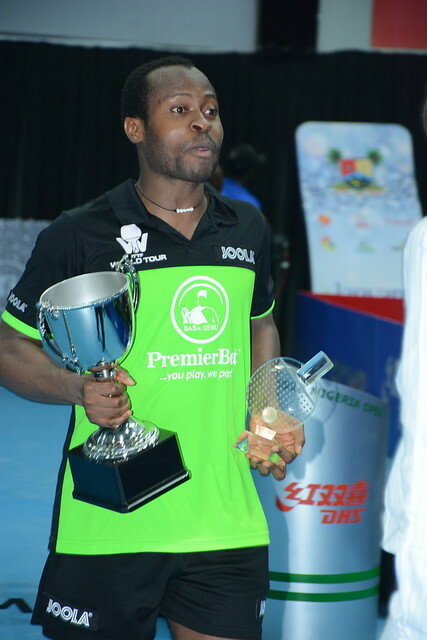 Winner last year in early October in Poland, to the delight of the packed crowd, not a spare seat in sight in the Sir Molade Okoya Thomas Indoor Sports Hall in Lagos, the host nation’s Quadri Aruna, the top seed, won the Men’s Singles title at the 2018 ITTF Challenge Seamaster Nigeria Open on the late afternoon of Sunday 12th August. In the final he beat Frenchman, Antoine Hachard, the no.16 seed, in six games (11-13, 11-3, 8-11, 11-7, 11-5, 11-7). Different styles in that Quadri Aruna is the more powerful player with the forehand dominant; conversely, the strength of Antoine Hachard is from the backhand. It was Antoine Hachard who made the better start, he established an 8-4 lead in the opening game, before Quadri Aruna responded to win the next five points; at 10-9 Quadri Aruna held game point, he was unable to convert. On his second opportunity at 12-11 Antoine Hachard seized the chance. A good start from Antoine Hachard in the opening game; it was the same in the second but from Quadri Aruna. He went ahead 7-1 and never looked back. Composed, continually directing the first attack towards the backhand of Quadri Aruna, Antoine Hachard secured an 8-5 lead in the third, before at 10-6 holding four game points, two were saved but not a third, the Frenchman held the advantage. In the fourth game, Antoine Hachard continued the policy of preventing Quadri Aruna executing a series of forehand top spin strokes. Striving ever sinew, Quadri Aruna established a 10-7 lead; he seized the first opportunity, it was parity. Undoubtedly the success was a momentum change, in the fifth game Quadri Aruna went ahead 4-1; Antoine Hachard with Benjamin Brossier courtside in the role of coach, called “Time Out”. However, the Nigerian hero was not to be denied, at 10-4 he held six game points; at the second time of asking, he converted. Bolstered by the passionate support, in the sixth game Quadri Aruna moved ahead 8-3, Antoine Hachard claimed the next two points, Quadri Aruna called “Time Out”. At 10-6 held four game point, somewhat anxious he lost the next but brought mind, body and soul together to secure the next, Lagos celebrated. Success for Quadri Aruna, he becomes the first player to win on home soil since the tournament was established as a Challenge tournament in 2014 and lays the ghosts to rest when he had to settle for runners up spot. 2018 ITTF Challenge Seamaster Nigeria Open.